The final piece of this series has been written by Denise Wright, who is the Race Relations Coordinator for South Belfast, on the committee of EMBRACE NI and member of City Church Belfast. Denise highlights how we can ‘welcome the stranger’, specifically at Christmas. I’ve been running a weekly Kids Klub in church for over 25 years and last week at the start of Advent we were hearing of Mary’s visit from Gabriel. I asked the kids how they’d feel if an angel suddenly turned up in their bedrooms and unsurprisingly their answer was afraid - very afraid! As I explained that angels always reassure those they appear to by saying “do not be afraid” it struck me again how natural it is to be fearful when God’s messengers turn up in our lives, there is a great risk that they are about to upset the status quo and call us to completely put our trust in God! We all know that Jesus himself spent his early years as a refugee in Egypt and I believe that when he explains that when the righteous ask “when did we see you a stranger and invite you in?” and he says “whatever you did for one of the least of these brothers or sisters you did for me” he is giving us exactly the same instructions. In the advent season we reflect on the coming of Christ and his intimate involvement with us as God incarnate, his willingness to open himself to pain, hurt, rejection and to clear a way for us to be adopted into his family, to enjoy all the unearned benefits of being God’s children. How might we emulate his example by opening ourselves up to embrace those who have come from elsewhere to make new lives in NI and welcome them to share with us? I’m blessed to belong to faith community who describes itself as a vibrant multicultural church. We work hard to be inclusive – not simply to welcome new people but to make space in our church family for everyone to find a home, somewhere that they can belong and contribute using the gifts God has given them. All our Kids Klub, praise, ministry and leadership teams reflect the diversity of a community of people made in God’s image. Many Minority Ethnic groups use our premises as a safe welcoming space to meet and we have been hosting Belfast Friendship Club every week in our cafe for 9 years. We host South Belfast Foodbank which supports many people who, as asylum seekers, are expected to live on £37.95 per week – half of what I would get if I was on benefits. 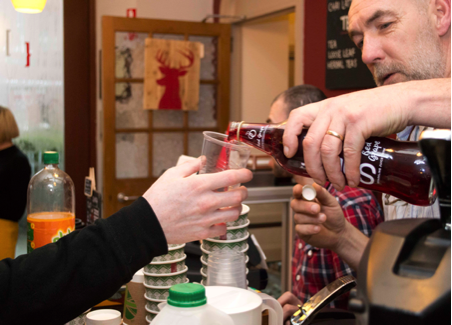 This year will be the 12th year where City Church open our doors on Christmas day to provide a free meal for those who would otherwise be alone or who can’t afford a Christmas dinner in Common Grounds Cafe. Many of them are far from home seeking a safe place to rebuild their lives and a community to belong to. Not every church is situated in the heart of a multicultural neighbourhood as we are but every Christian is called to be a welcomer. Say hello to new parents at the school gates and make sure your own children include the newcomers in their schools. Get involved in Foodbank across NI volunteering or donating goods. Everyone could buy an extra few groceries and put them in the receptacles in many of the major supermarkets. Smile and say hello to the Big Issue seller who sits on the street in your town or buy them a hot chocolate simply say God bless you. Invite people to your carol service. We should be the ones to speak up when we hear racist comments and anti immigration rhetoric being sure that that is what Jesus himself would do. It is also more than likely that he would also be on the receiving end of it if he was here in person! My Kids Klub is now almost all Romanian Roma children who live in the local community. When our Roma kids were colouring in nativity pictures this week one little girl asked what colour Mary and Joseph’s skin and hair should be and I replied – exactly like yours! What you do to the least of these you do to me! 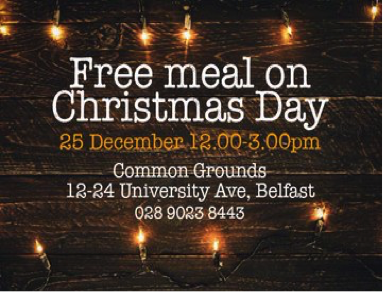 You’d be very welcome to take some time out of your Christmas day to volunteer or drop off some pre prepared food at our City Church Christmas meal.